South Gallia’s Braxton Hardy (1) drives through the OVCS defense, during the second half of the Rebels’ 83-27 victory on Friday in Mercerville, Ohio. OVCS junior Miciah Swab (30) drives past SGHS junior Bryce Nolan (left) during the first half of South Gallia’s 56-point win on Friday in Mercerville, Ohio. MERCERVILLE, Ohio — They started fast and kept their foot on the gas. 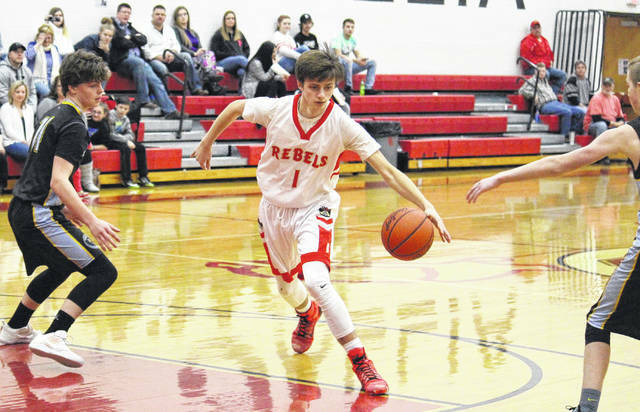 The South Gallia boys basketball team led by double digits within the opening 3:30 of Friday night’s non-conference bout in Gallia County, and the Rebels — who made at least seven field goals in each quarter — rolled to an 83-27 victory over visiting Ohio Valley Christian. The Rebels (1-6) scored the first 10 points of the game and jolted out to a 21-2 lead by the end of the first quarter. The Defenders didn’t make their first field goal until the final minute of the second quarter, as South Gallia stretched its lead to 47-6 by halftime. Ohio Valley Christian’s best offensive and defensive quarter of the night came in the third, but SGHS still outscored its guest by a 17-to-12 count, making the margin 64-18 with eight minutes to play. All-11 Rebels found their way into the game in the fourth quarter, in which they outscored OVCS by a 19-to-9 clip. South Gallia capped off its 83-27 win with a 10-3 run, making the 56-point final margin its largest lead of the night. From the field, South Gallia shot 36-of-69 (52.2 percent), including 7-of-18 (38.9 percent) from three-point range. The Defenders made 8-of-43 (18.6 percent) field goal attempts, while missing all-8 of their three-point tries. From the free throw line, SGHS shot 4-of-10 (40 percent) and OVCS shot 11-of-31 (35.5 percent). 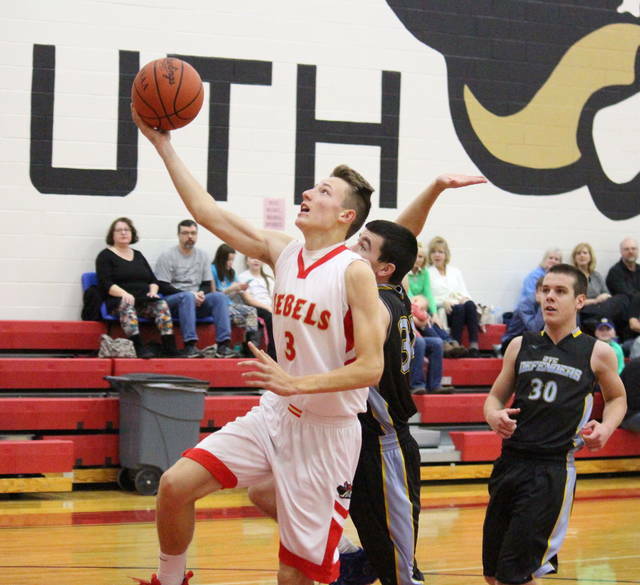 South Gallia won the rebounding battle by a 43-to-28 tally, including 14-to-8 on the offensive end. SGHS also claimed advantages of 26-to-4 in assists and 16-to-5 in steals, while Ohio Valley Christian earned a 2-to-1 edge in blocked shots. The Rebels gave the ball away 14 times in the win, while OVCS turned the ball over 23 times. Every Rebel scored in the win, led by Braxton Hardy with 17 points, six of which came from long range. 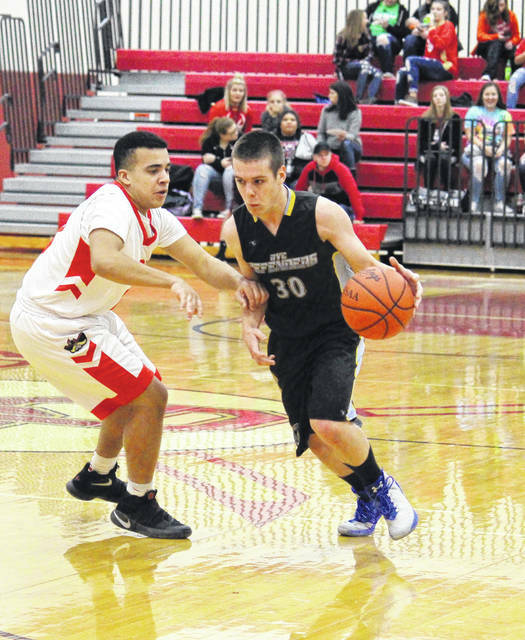 Curtis Haner and Eli Ellis both scored 15 points for the victors, with Haner making one three-pointer. Jared Burdette hit a trio of trifectas en route to 11 points, while Bryce Nolan finished with six markers. Andrew Small and Austin Day scored five points apiece for the Red and Gold, with Small making one triple. Jaxxon Mabe contributed three points to the Rebel cause, while Austin Stapleton, Ethan Bevan and Bryceton Folden each chipped in with two points. Ellis pulled in a game-high 15 rebounds in the win, Hardy picked up a team-leading seven assists, while Day and Burdette led the Rebele defense with four steals and one block respectively. Andrew Dubs led the guests with 11 points, followed by Arden Peck with seven. Asher Peck and Justin Beaver posted three points apiece, Jeremiah Swab added two markers, while Miciah Swab scored one. Dubs earned his double-double by pulling in a team-best 10 rebounds, while Bryce Gruber had a two assists to lead the guests. Beaver led the OVCS defense with two steals and two rejections. 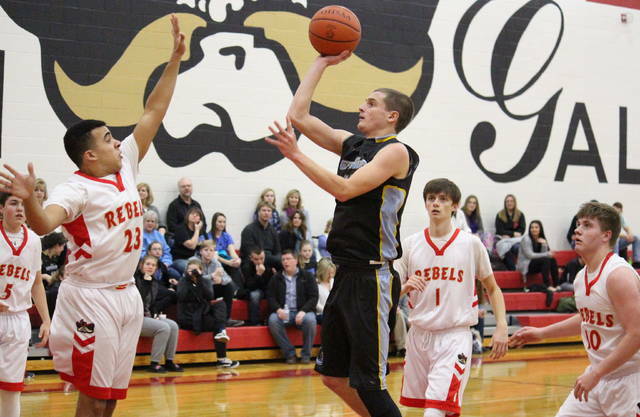 The Defenders and Rebels are scheduled to meet again on Jan. 15 at OVCS. After a non-league trip to Green on Saturday, the Rebels will get back to work in the Tri-Valley Conference Hocking Division on Friday at Belpre. Ohio Valley Christian will try to bounce back on Tuesday when it hosts Wayne.